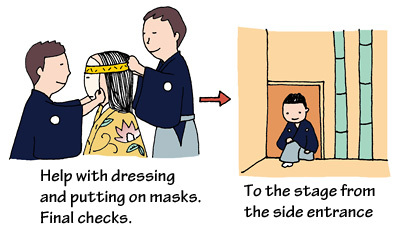 TRIVIA of Noh : Q91 : What kind of jobs does a kōken do when he is off stage? | Home | Trivia | Q91 : What kind of jobs does a kōken do when he is off stage? What kind of jobs does a kōken do when he is off stage? Kōken, the assistants who sit upstage left, have a wide range of tasks far beyond their duty to pay close attention to the entire stage. Before the performance starts, they make elaborate preparations so that the show goes smoothly. These include preparing costumes, helping actors to dress, and holding a preliminary meeting with the leading actor to discuss the stage sequences. An important task of an assistant is tying the strings of the leading actor's mask, to see how it fits. After completing the preparations, the assistants give a cue to the musicians, who have finished their tuning up. The musicians then go through the curtain and proceed to the stage. After raising the curtain, the head assistant does a final check on the leading actor and sends him off to the stage; then he moves behind the stage to the opposite side. He waits until the leading actor takes his position on the main stage, and then appears from the side entrance to seat himself in his position. If the leading actor exits in the interval, the assistants help him change costume quickly and efficiently for the second half. When the play reaches the final phase, they are the first to leave the stage from the side entrance and wait for the leading actor behind the curtain.